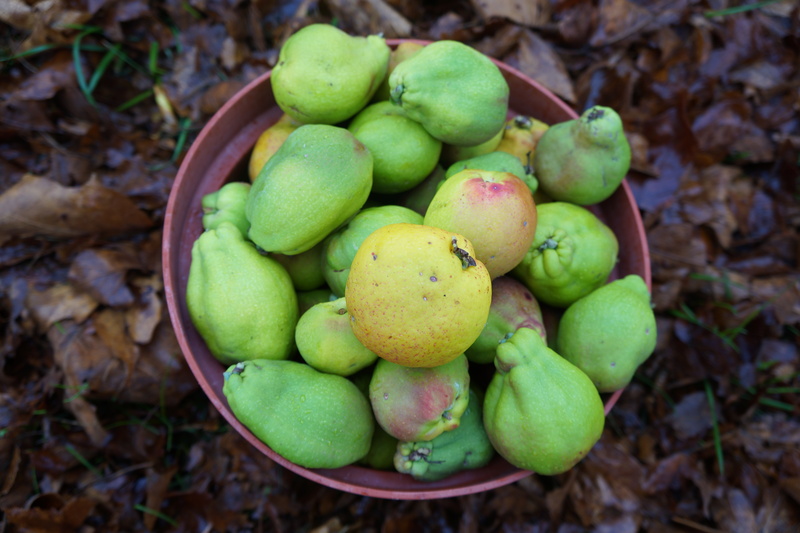 There is frost predicted in this region within the next day, so I am in some hurry to rescue as much from the garden as I can. And as I do that, I thank all of you who have posted timely recipes on squash, kale, and the like – many of which we have enjoyed! It being Friday, I know that Angie’s guests will be bringing more treats from the garden – and elsewhere – to her 40th Fiesta Friday. Among the plants I have harvested is my copious rose geranium and some feral apples, so Turkish delight seemed an obvious choice. I know this is not usually made with apples, but any fruit will do, and many recipes just call for flavouring, sugar and cornstarch, so this had to be better. The apples, being from an abandoned orchard, are not treated with chemicals, and although a little irregular looking, are perfect for cooking, even with the skin on. Once again, I decided to use honey to avoid excess of sugar, but I will admit that it overpowers the rose flavour somewhat. Another time, I would either use half honey and half sugar, or add more geranium leaves to the mixture. You could easily make this recipe with any fruit and flavouring, as well as chopped nuts. It is the cornstarch which gels it, so the pectin in the apples helps but is not essential. You could also use flavours like lemon, rosewater, pomegranate etc. 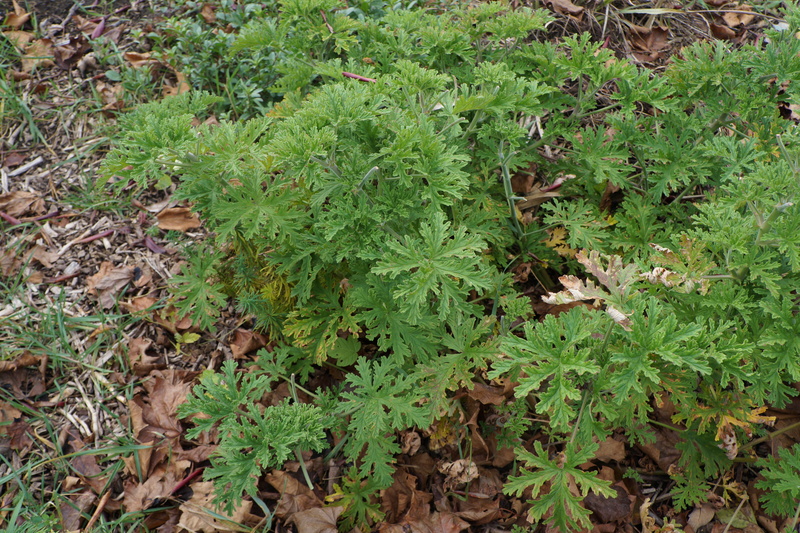 instead of the geranium leaves. Step 1. Cut the apples into large pieces and cover with water in a pan. I had enough to fill a large pot. Add a handful of rose scented geranium leaves and simmer until the fruit is very soft. Strain and measure the liquid. I had 4 cups. Step 2. Add by volume one half the amount of honey, or 2 cups for this amount. Step 3. While this is boiling, measure 1/2 cup of cornstarch, 1/2 tsp cream of tartar and blend it with 1 cup of water. Mix well. Step 4. When the syrup is boiled down and the right temperature, add the cornstarch mixture and stir over medium heat for about 10-15 minutes. It will get very thick and dark. Step 5. Pour into a pan lined with slightly oiled parchment paper. Cover with plastic wrap while it cools to prevent a crust forming. Allow to cool for 3-4 hours. Step 6. Cut into squares and coat each square with a ratio of 1 cup icing (confectioner’s) sugar to 2 Tbsp cornstarch. This makes approximately 25 pieces. I will definitely be making some version of this recipe again, depending on the season and ingredients available. Categories: dessert, jams and jellies, recipes, sweets, wild fruit | Tags: apples, Fiesta Friday, foraging, honey, rose scented geraniums, Turkish delight, wild edibles | Permalink. 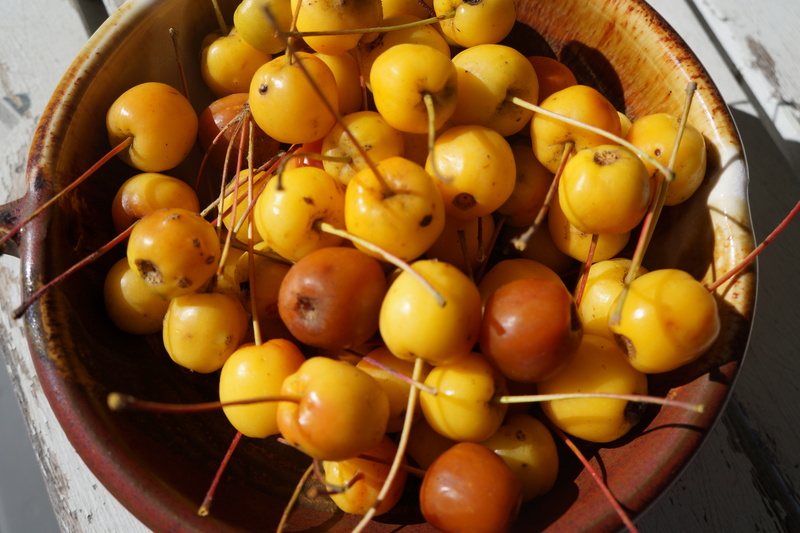 Someone who knew I wouldn’t let them go to waste gave me a few crabapples from her garden – small yellow ones about the size of cherries. There are so many ways I could have used them, but given the rich flavour and high pectin content of these mini fruits, I decided to make another jelly with them. Crabapple jelly is not worth writing about in itself, and it combines so well with other fruits and berries, I knew I could come up with an original recipe. I had been wanting to make sea-buckthorn jam or jelly too, and by using little crabapples I could do this without having to add any commercial pectin – or even make my own. If you are unfamiliar with this particular berry, please refer to this post. I also wanted to make a jelly with honey, since my Japanese quince honey paste was so successful. For Angie’s Fiesta Friday #39, I wanted to showcase this gorgeous jelly in a way that would get her guests’ attention, but with a recipe that would fit into our household’s diet. We don’t consume much cake, but if it is something I can put part of in the freezer for an emergency, it takes away the guilt of either over-eating or over-wasting. So I decided to make a very plain Victorian sponge and jazz it up by filling it with my jelly. No rich icing, no butter or oil, just a light fluffy casing for the best jelly ever! To make the jelly, I used 2 parts by volume of crabapples and 1 part sea-buckthorn. If you are curious as to what sea-buckthorn is, refer to this post. No need to peel, core or even remove the stems from the apples. I simmered the apples keeping them well covered with water at all times. Once they were really soft, I added the berries and simmered just a couple of minutes longer. Other berries could be used with this same method. I strained the mixture through a clean tea towel and let sit overnight. Do not press any of the pulp through. I measured the liquid and added an equal amount of honey. At this point, you should taste it for sweetness, and the amount of honey you need will vary depending on the sweetness of the fruit and berries. Don’t get carried away though, because too much sweetening tends to detract from the taste of the main ingredients. Allow the mixture to simmer until it is jelled. To check, I put a small amount in a chilled saucer (or in my case egg cup) and let it sit a couple of minutes. When it has reached the right consistency, set to cool. Instead of a murky orange mixture which I was expecting, it turned out deep red and very clear. You can taste all three ingredients, and they meld very well together. It has a stronger flavour than most fruit jellies I have tried, but no hint of bitterness at all. You can use any sponge cake recipe, but I used gluten-free cornflour. To make this cake, you will need 3 whole eggs, 1/2 cup sugar, 3/4 cup of cornflour, 1 tsp of baking powder and 1/4 tsp salt. I also added a couple of cardamom seeds (optional), which I ground with the sugar for a super fine consistency. Beat the eggs a lot, until they are really fluffy. Add the ground sugar gradually while still beating, making sure the sugar dissolves after each addition. Sift and fold in the dry ingredients. Fill 12 individual cake liners about three quarters full. Drop a spoonful of jelly on top of each cake. The jelly will sink, so no need to cover them. Bake at 350 F for half an hour until crisp and golden on top. Dust with a little icing sugar if you like just to make them a little prettier. If you want an entire cake, you could bake it in a cake tin, slice in two when cool and spread the jelly in the middle in a sandwich form. This would be a better way to preserve the integrity of the jelly, which when baked got partially absorbed into the spongy batter. Categories: baking, dessert, jams and jellies, recipes | Tags: crabapples, Fiesta Friday, foraging, fruit jelly, gluten free, honey, organic fruit, Sea buckthorn, sponge cake | Permalink. 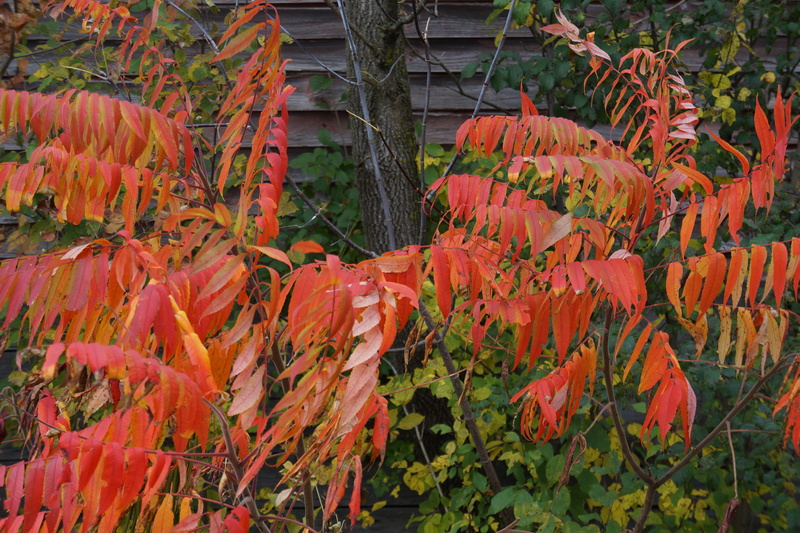 The sumac shrubs are at their height now in terms of colour. There are masses of them along the roadside, but I decided to photograph my own for this post. 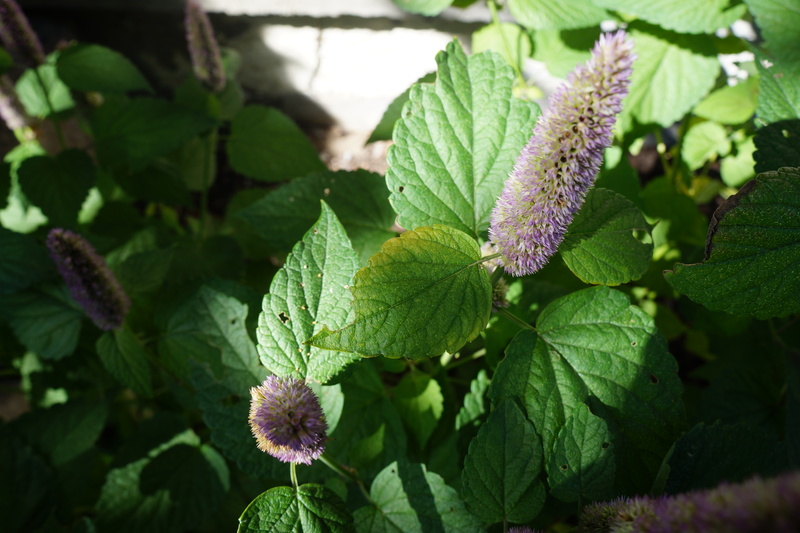 The first one is the focal point in one of my flower beds, and the others are just little shrubs growing next to the shed. I need to collect more of the berries, but the weather has been so wet, I have to wait until they are drier, as they lose some of their flavour when rained on. We might need to reach freezing temperatures before they are pickable, but at least it will be dry, and the berries will wait. 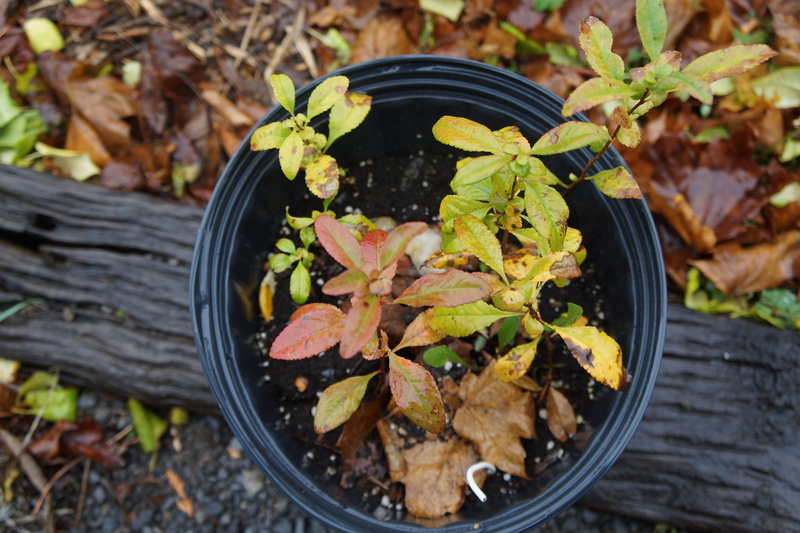 If you need any information regarding sumac, please refer to this post. Meanwhile, I used some of my store of powdered sumac to use in this recipe using walnuts and eggplant (or aubergine). 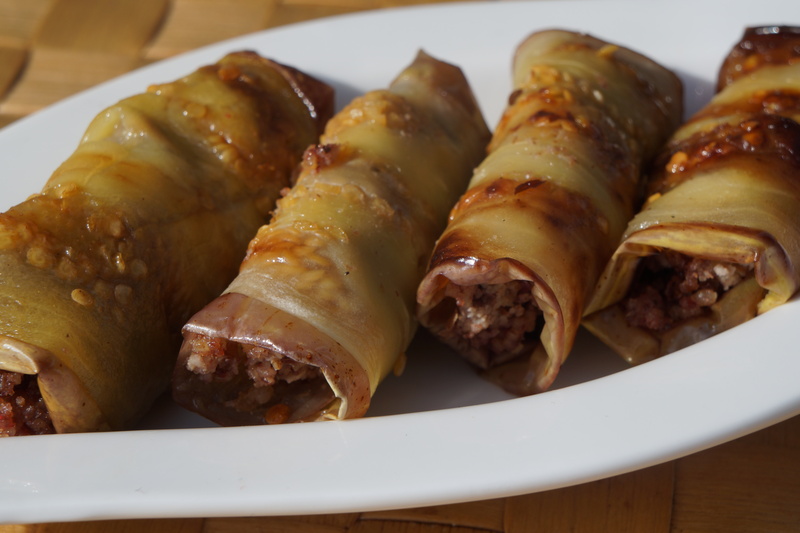 It is a very popular Georgian recipe which I discovered in Russia. I was told the stuffing was made with just ground walnuts, but additions can be and are made. In Georgia, there are often several spices added, and sometimes petals of edible flowers to give it some colour. I have made it many times, always trying to duplicate the distinct flavour of the ones I bought in the Russian market. This is the recipe I came up with. Place them in a shallow dish and sprinkle liberally with salt. Leave them for 30 minutes to 2 hours. Rinse the salt off completely, and pat dry. This step can be omitted, but it helps to remove any bitterness from the eggplant. Because I always detect some salt even after rinsing them, I did not put salt in the recipe. Fry each piece in some oil on both sides until they are lightly browned and cooked right through. For the paste, put all the ingredients in a food processor and blitz really well until it all holds together. If it is too crumbly, add a few drops more vinegar. Place a spoonful of the walnut mixture along the base of the aubergine slice and roll up. That’s it! These little rolls are a great appetizer, picnic food or served with a salad or rustic bread. They are eaten either chilled or at room temperature, which is how I prefer them. I wish I could describe how they taste, so much better than the sum of their parts, but there are no words that convey their distinct flavour. I am bringing these tasty appetizers to Angie’s 38th fabulous Fiesta Friday. I hope you will drop by this virtual party, and if you have a dish you would like to bring along, click here for the simple instructions. Categories: edible weeds, garden vegetable, recipes, snacks | Tags: appetizers, aubergine, eggplant, Fiesta Friday, Georgian cooking, gluten free, sumac, vegan, walnuts | Permalink. Most of the summer’s harvest has already been brought in, with the exception of potatoes, leeks and a few tough greens, so the gardener (me) has a little more leisure at this time of year. Of course, there is some clean-up required, but that can wait. The forager (also me) still has plenty on her plate. I won’t even attempt to list all the things I should be out there harvesting, if it ever stops raining long enough. But one activity I have indulged in is harvesting the great crop of seeds I have – the usual garden produce of course, but also some of the weeds, perennials and self seeding flowers. If you want to be ready in the spring to plant your best garden ever, collecting seeds makes a lot of sense. 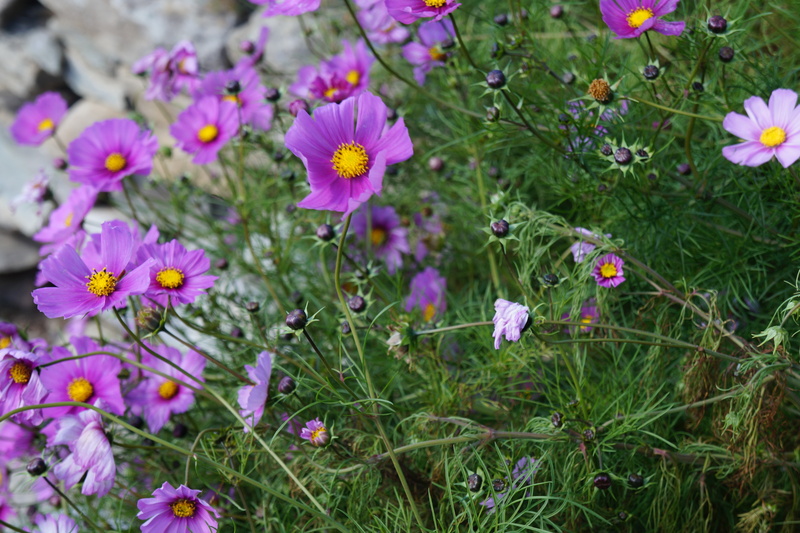 I must have about a million cosmos seeds which I hope to spread through all our fallow fields. Maybe! It also occurred to me that for people with less space to broadcast millions of seeds, it also makes a lot of sense to select a few seeds to be saved for the spring. They can be planted in pots and set on patios, window sills or wherever you choose. There are some plants which are particularly suited for this purpose, and will give you every bit as much beauty as the store-bought annuals – they can even be planted along with for a little ‘diversity’. They will also provide you with the wherewithal to do a little safe foraging without having to leave the comfort of your home. Foraging is not just for the intrepid. 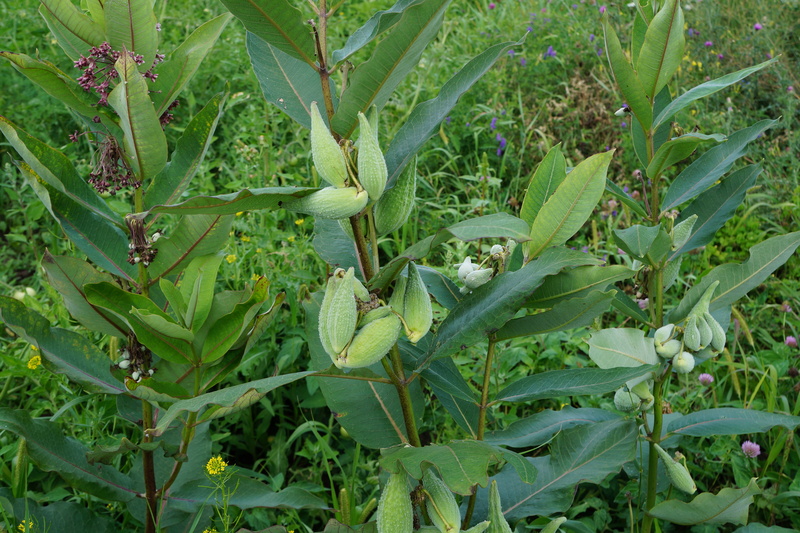 If you have enough of some of these plants, the seeds can also be collected, dried and used in cooking. This can be a tedious job, and one I don’t usually recommend. I have tried the usual method, of spilling them from one plate on to another in a breezy spot, but too many seeds were lost in the process. 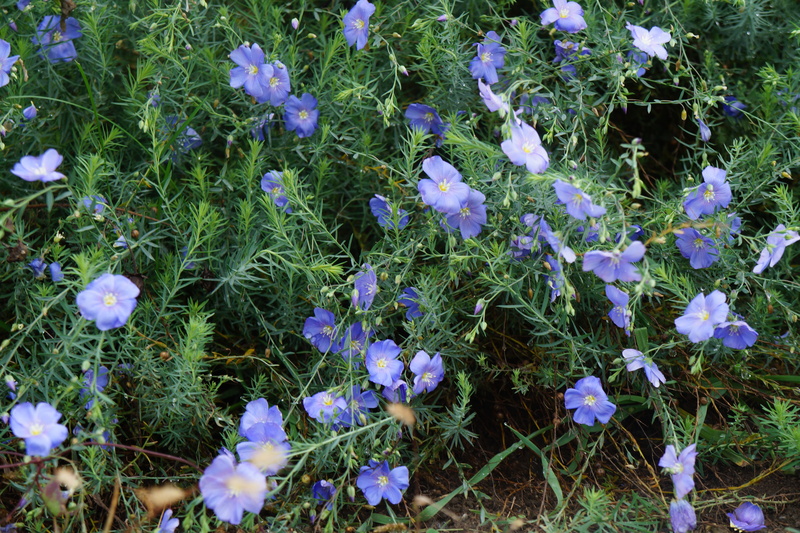 However, I did lately discover a very easy method for collecting and winnowing flax seeds. It requires quite a few seeds, some time in picking them but after that it is so easy with my, I believe, original method. 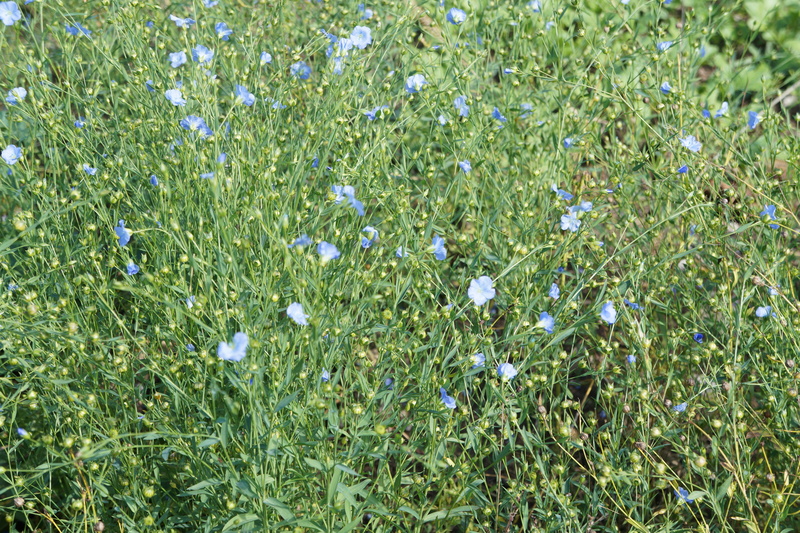 This large patch of flax is going to seed gradually. 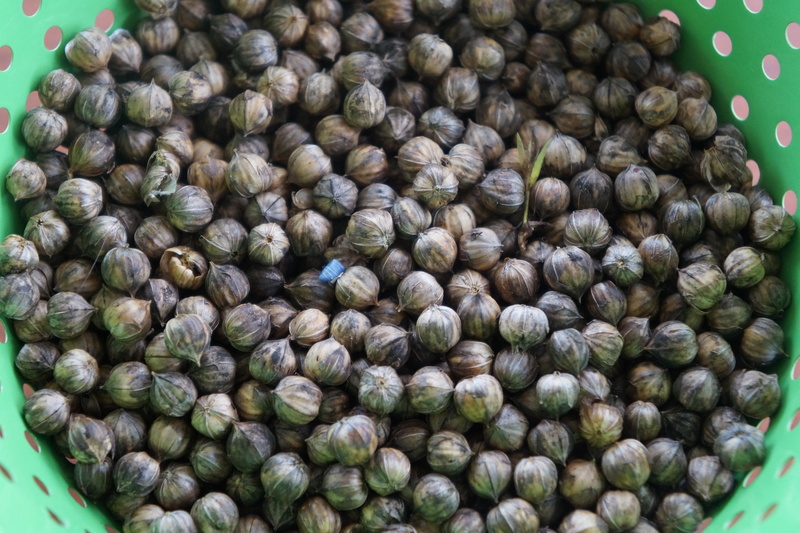 You can see in the photo the little beige seed pods which are ready to be picked. I gathered a few of these. I put them in a blender and chopped them up as much as possible. 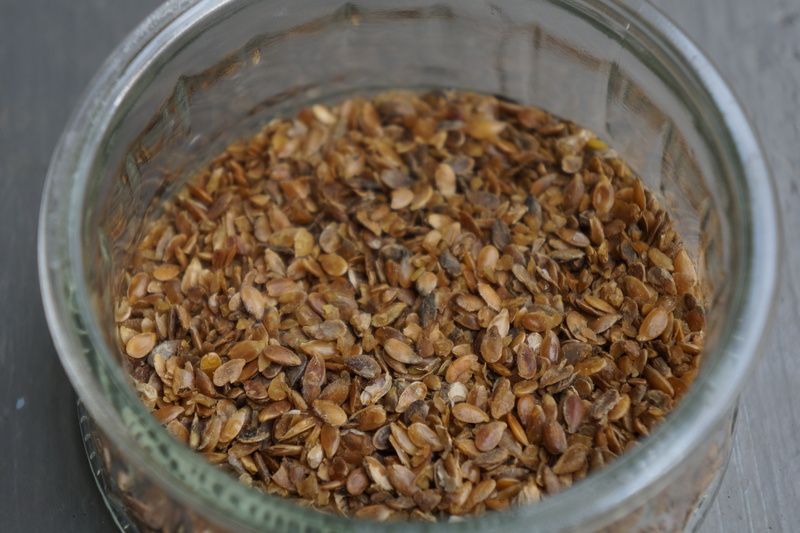 If you have ever tried to grind flax seeds in a blender, you will know it has no effect on the seeds. For their pods and whatnot, it is another matter. I just blended until I had a fluffy mass of seed pods. Then I took them outside where luckily there was a nice breeze, or maybe it was even wind. I put a deep bowl on the ground and poured the fluff through a funnel, held about two feet above the bowl. Unfortunately, I was unable to take a picture of myself doing this, but as the mixture fell through the funnel, a great cloud of seed covering was seen floating off into the atmosphere. After one try, the seeds were pretty clean, but I repeated this two more times and ended up with these seeds. 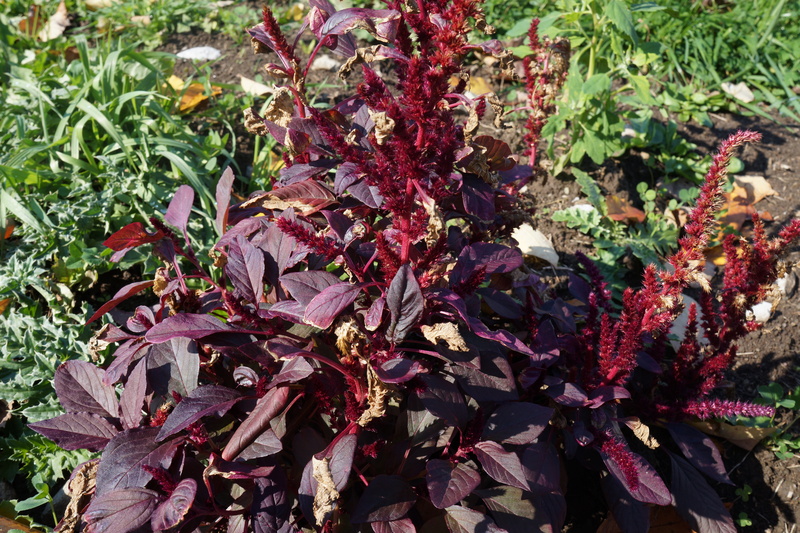 This method did not work so well with the amaranth seeds I tried. If you know of any easy, practical method of winnowing seeds, please do share. 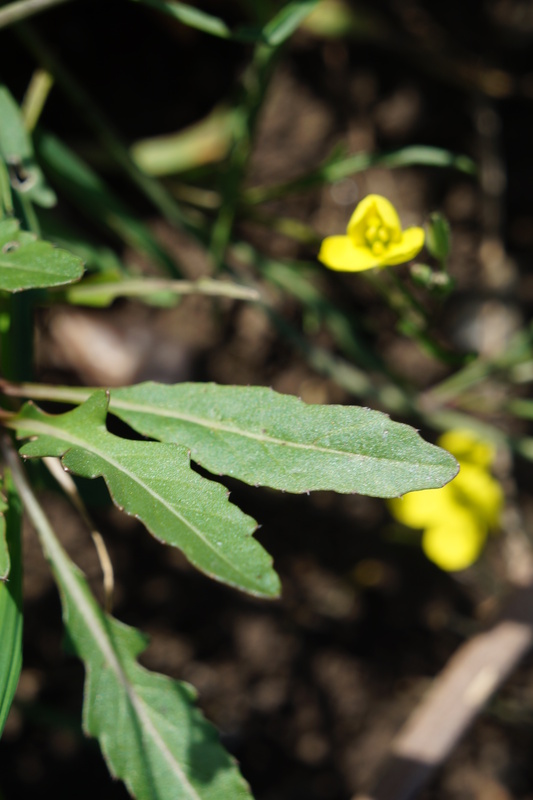 Categories: edible weeds | Tags: amaranth, anis hysop, backyard foraging, cosmos, flax, milkweed, perennial arugula, saving seeds, seeds, winnowing seeds | Permalink. 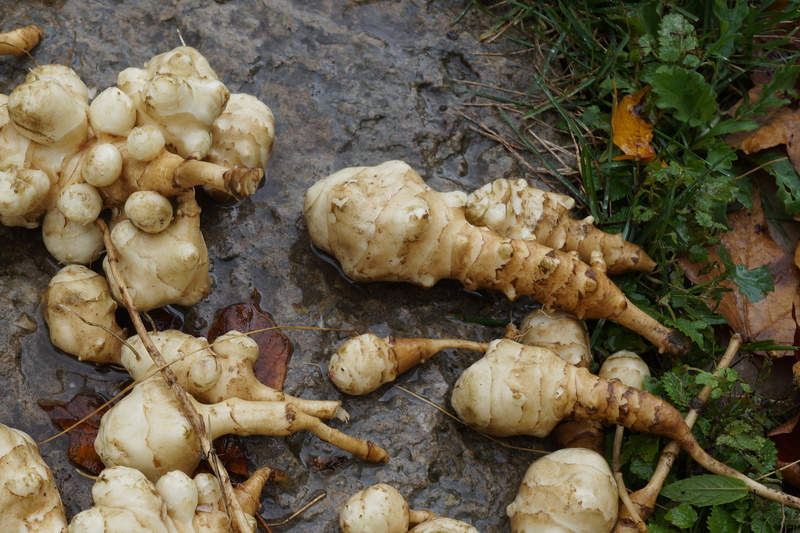 I made Jerusalem artichoke (or sunchoke) chips last year, and was so pleased with the result that I had to try it again this year, now that the tubers are ripe for digging up. They should be even sweeter after a little more frost, but if I wait too long, the ground will be too hard and many will go to waste. These vegetables are not usually eaten in large quantities, but a few little crispy chips are really very easy to eat, and unless you overdo it, you should not have any ill effects. Fried snacks should only be eaten in moderation anyway. If you are not familiar with these, you might see them in some farmers’ markets and good grocery stores at this time of year. They are not really artichokes, but rather of the sunflower family, and have a distinctive artichoke flavour. 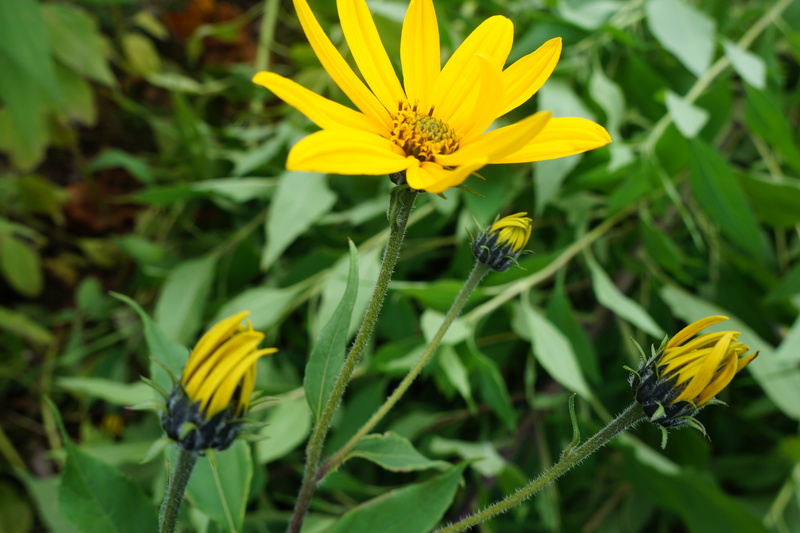 They grow beautifully in a sunny area, produce year after year with absolutely no care whatsoever, and provide bright yellow flowers in the fall when most other flowers are shutting down. Roasted, boiled or fried, they make a delicious side dish, but I dry most of mine, which makes storing them easy. Once dried and ground into flour, they make a great thickener for sauces and can be added to lots of savoury baked recipes. I am bringing these chips flavoured with lime and coconut oil to Angie’s 37th Fiesta Friday, which I will be co-hosting with fellow-Canadian and co-host extraordinaire Julianna of Foodie on Board. Feel free to visit Angie’s site, and see what the guests bring this week. If you are still looking for some original recipes for your Canadian Thanksgiving dinner this weekend, I am sure you will find something perfect for the occasion. Should you wish to bring a dish along to the party, first read the guidelines here. 1. Slice the Jerusalem artichokes very thinly, as you would for potato chips. If they are fresh, no need to peel, just give them a good scrub. If the skin has become brown and thicker, then it should be removed. 2. Place in a bowl and pour freshly squeezed lime juice over them so that each slice is covered, and add a little grated lime zest for extra flavour. 3. Place them on a baking tray and put in a barely warm oven until they are no longer soaking wet. They will still feel damp, but most of the juice will have evaporated. 4. Heat the coconut oil, and fry just a few at a time, until they are golden brown. Remove and drain on absorbent paper. 5. Serve while still warm. If they are left at room temperature for a while, they will lose their crispness, in which case just reheat briefly in the oven on a tray until they crisp up again. The flavour of lime makes these Jerusalem artichoke chips extra delicious, although lemon could also be used. They don’t even really need salt. Categories: edible weeds, jerusalem artichoke, snacks | Tags: backyard foraging, chips, coconut oil, Fiesta Friday, jerusalem artichokes, lime, snacks, sunchokes | Permalink. Our lawn is covered in mostly brown leaves which have fallen from our sugar maples on the front lawn. 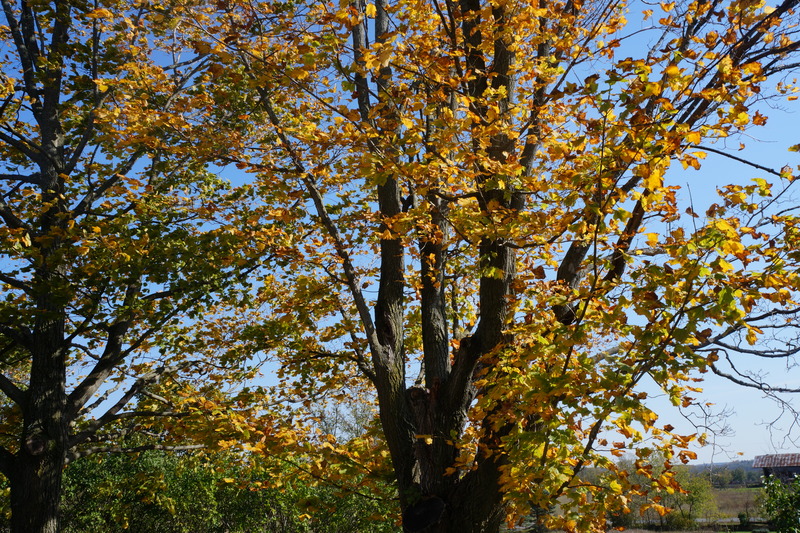 Except for a few which I will rake up to cover some of my delicate plants, they will stay there till spring, get chopped up in the first mowing, and return to the ground as a kind of natural fertilizer. It never had occurred to me to collect any of these leaves as a source of food until I came across this article about a Japanese recipe for fried maple leaves in a sweet tempura batter. In this article they had the advantage of Japanese maple, which is a much more defined leaf, but I decided to use what I have, which is sugar maple. 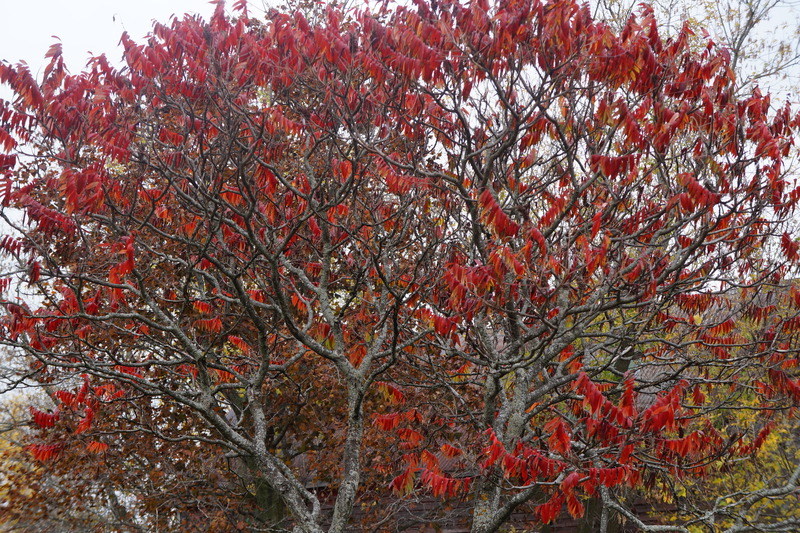 If you have Japanese maple leaves, you might want to try them – the result is so pretty. Just look at those pictures. Categories: snacks, Uncategorized | Tags: autumn leaves, edible leaves, foraging, fritters, local, maple, maple sugar | Permalink.